Our graduate program was established in 1974 and has a history of more than 40 years of world-class research, especially in artificial intelligence/human-computer interaction, software systems, and the theory of computation. We provide a collegial, interactive environment in which faculty directly mentor students. All faculty and PhD students, regardless of their area, are familiar with each other’s work. This is possible only in a relatively small, close-knit department. Our philosophy is that computer science research is a community endeavor, crucially dependent on the vitality of the local community in which it takes place. We believe that graduate students are the heart of our research productivity, and we make them first-class department citizens. Graduate students serve on all department committees and, in particular, are crucial members of faculty and graduate student recruitment efforts. The PhD program includes courses, examinations, projects, research and teaching assistantships, and a doctoral dissertation developed under the supervision of a faculty advisor. For more information see the PhD page. The MS program is based on coursework and optional research and is designed for students who do not intend to complete a PhD degree at University of Rochester. It is particularly appropriate for students who have an undergraduate degree in fields other than computer science, but seek a career in computer science. For more information see the MS page. To learn more about the computer science research being done here at Rochester visit our research page. Our size also allows helps to create a warm and friendly atmosphere. 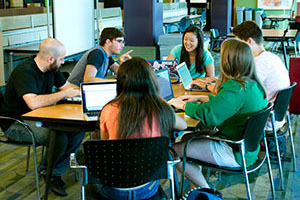 Many of our graduate students and faculty relax in the graduate student lounge, located on the seventh floor of the Computer Studies Building. Students and faculty will also get together for social events hosted by the department throughout the year. Our graduate students also participate in various events and activities sponsored by the Graduate Organizing Group (GOG), including bowling, tango lessons, and day trips to nearby scenic locations.